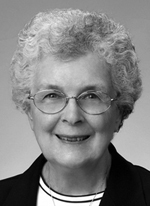 Sister Georgine Marie Smith, O.S.F. Sister of St. Francis of Philadelphia Georgine Marie Smith, 88, died June 9 at Assisi House in Aston. She had been a professed member of the Sisters of St. Francis for 68 years. Sister Georgine Marie (formerly Phyllis Jean Smith) was born in Baltimore, Md., where she was a member of St. Elizabeth Parish and a graduate of the Catholic High School of Baltimore. She entered the congregation in 1945 and professed her first vows in 1948. She earned her bachelor of science and master of science degrees in education. She ministered in elementary schools in Baltimore and Silver Spring, Md., and in Wilmington, Del., including 41 years of ministry in the Archdiocese of Baltimore. Sister Georgine Marie ministered for 16 years in the Diocese of Wilmington. She began her work in education there, teaching at St. Paul School. She later returned to Wilmington and taught at St. Joseph on the Brandywine School. Her funeral Mass was celebrated June 15 at Assisi House. Burial was in Our Lady of Angels Cemetery in Aston. Sister Georgine is survived by her sisters, Nancy (Edward) Dentz, Mary Ellen Sologuren, her brother Paul (Anne) Smith, by her nieces and nephews, and by her Franciscan family.